There’s a hazard lurking on our highways and roads. One that causes over 100,000 accidents a year yet isn’t rightfully acknowledged like well-known road hazards such as drunk driving and texting while driving. This hazard is drowsy driving – a problem that is avoidable under most circumstances. This article will examine drowsy driving, its dangers, whom it affects and how to prevent it. Sleep, much like eating, is governed by powerful internal drives and impulses that are deeply rooted in our biology. Just like people are unable to stave off hunger, they are unable to stave off the need to sleep. It is so strong that it is capable of overcoming just about any driver, regardless of age or driving experience. 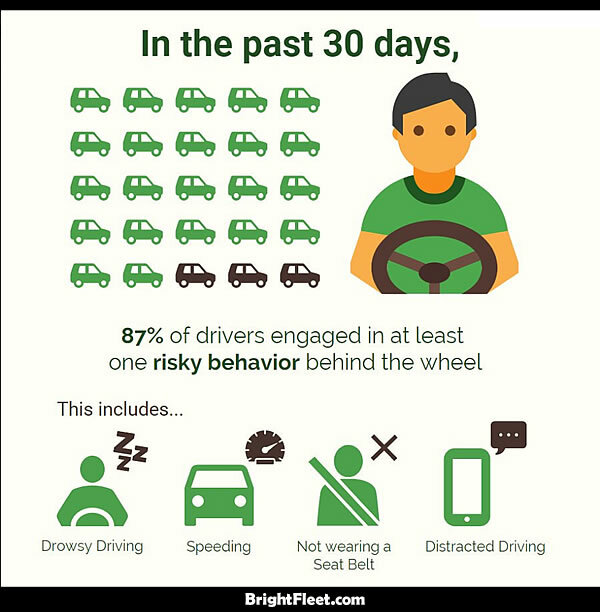 Drowsy driving affects our ability to drive in a number of ways. It lowers our ability to concentrate on the road, reduces our reaction time and creates an attention deficit. It has been proven that being awake for 18 hours is equivalent to having a blood alcohol level of .05 percent. While that’s an extreme example, even losing a few hours of sleep can result in some form of drowsy driving, and pose a major risk not only to the driver but also to everyone else on the road. Many people drive drowsy because they think they’ll be able to anticipate the moment they reach their limit, and pull over if they become too tired. However, what usually happens is that they fall asleep at some point instead. This happens so quickly that drivers don’t even remember it. People involved in accidents caused by drowsy driving report being aware of being sleepy but they cannot remember exactly what happened; they had fallen asleep only for a brief moment. While it’s likely that anyone can fall victim to drowsy driving, there are some data that suggest that certain groups of people are more vulnerable than others. These include commercial drivers who drive buses, tow trucks or tractor trailers; drivers 25 years of age or younger; shift workers; those with untreated sleep disorders such as sleep apnea, insomnia and delayed phase sleep disorder, and drivers who use medications that make them sleepy. If the driver experiences any of these symptoms, then he/she should immediately stop driving and get some rest. There are several different tactics you can use to avoid drowsy driving. However, there are also some dubious tactics that are commonly advocated but actually do very little or nothing at all to combat the problem. Some of these include blasting the radio, rolling down the window, eating, chewing gum or crunching on ice. These methods have limited short-term effects or no effect at all on drowsy driving. That’s because they treat the symptoms and not the underlying problem—the fatigue of the mind and body. The best antidote to drowsy driving is to plan ahead and make sure that you get 7 to 8 hours of sleep before you begin driving. However, if that’s not possible, there are quite a few things you can do to alleviate drowsy driving. Sometimes all that is required is to take a 15-20 minute nap before your drive. It’s also a good idea to avoid driving when it is most likely you’ll become drowsy. Because of our circadian rhythm, we get extremely sleepy between midnight and 6 am, and between 1 pm and 3 pm. If possible, you should avoid driving during this period. You can also consume caffeine since it does have some affect on drowsiness, about 30 minutes after consumption — but this affect only lasts a few hours and shouldn’t be depended upon for a long-term solution. It only shortly delays the urge to sleep and doesn’t treat the underlying problem — mental and physical fatigue. It is best to drink caffeine before taking a 15-minute nap. This way, you’ll get the benefit of a nap and by the time you wake up, caffeine will have kicked in. This enables you to get the best of both worlds. The main thing to understand about drowsy driving is that it is not only extremely dangerous, but that it can affect anyone at any time. Paying attention to your body and taking measures to avoid driving drowsy will not only keep you safe but will keep your fellow drivers safe as well.